Distracted driving has become increasingly commonplace with the growing number of gadgets like cell phones, GPS, iPods, and radios. According to the most recent government statistics, at any given moment there are approximately 660,000 people using electronic devices while driving. Additionally, in just one year 3,331 people were killed in car crashes involving distracted driving and an additional 387,000 people were injured (i). People who have been injured in a distracted driving motor vehicle accident may be able to recover for medical expenses, lost income, property damage, and other losses in a car crash lawsuit. Texting and driving may be commonplace because people do not fully understand the reality of just how dangerous it is. On July 20, 2013, the Providence Journal reported on a string of fatal car accidents that occurred in Burriville, RI within a two-week period. According to the police, all of these recent accidents were preventable and one involved texting and driving. Witnesses reported that the driver of a Kia was looking down at a cellphone when her Optima veered into another lane striking a Dodge Caravan. The driver of the Kia was killed in the accident as well as one of the passengers who was not wearing a seatbelt. According to the article, the police are looking into installing rumble strips and are going to begin a campaign to raise awareness about the dangers of distracted driving (ii). Attorney Paul dOliveira stated, It is always tragic to read these types of stories. Texting and driving is especially dangerous at highway speeds because cars can travel the length of a football field in the time it takes to check a cellphone. The injuries caused by these types of car crashes can be life-altering so it is important to have a lawyer who understands all of your options and has the experience to get you the most compensation. Our law firm has helped thousands of clients get the money they need for their injuries. The texting and driving infographic highlights the dangers of distracted driving by illustrating common injuries like bruises, cuts, fractures, broken bones, and traumatic brain injury (TBI). dOliveira & Associates added this informational graphic to its existing public service announcement (PSA) video in an effort to raise awareness about the true risks of texting and driving. The law firm has successfully handled thousands of auto accident lawsuits and it has experience negotiating with insurance companies. To contact the firm call 1-800-992-6878 or submit a contact form online. 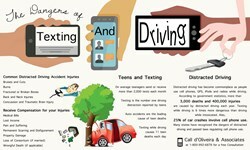 (i) Department of Transportation, Distracted Driving Facts and Statistics. (ii) Providence Journal, July 20, 2013.